Our pets like to hang around while we are working. Shop dog Ziggy mostly hangs out (in the shop, of course) with Jay and our cats are either sleeping in their basket beside my desk or are under foot while I am shooting photos. 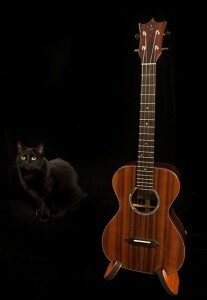 Mackenzie insisted on getting my attention while I was shooting this latest custom ukulele and the result was an unintended cool photo of … a cat and a ukulele.